October is officially Halloween month, and with Halloween comes fright fests, The Walking Dead on AMC, and Horror films. I mention AMC and The Walking Dead for a reason, before the success of the zombie apocalypse themed show they used to run a count down of the 100 scariest movies this time of year. 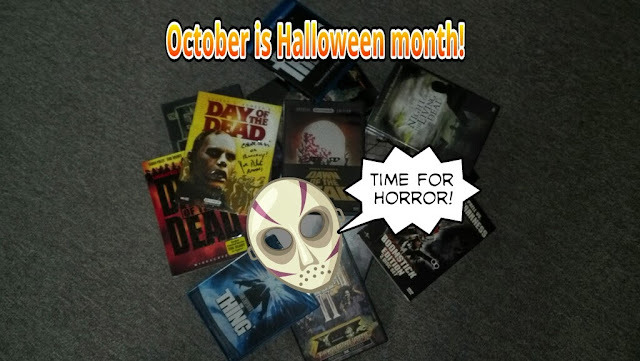 That has been replaced by The Walking Dead and their Fearfest marathon of horror films, that include Halloween, Friday the 13th, and A Nightmare on Elm Street. Although they keep with the theme and give horror fans the love they deserve, sometimes certain films don't make the cut. The go to Horror Movies for Halloween. Jason Voorhee's Mom must own stock at AMC because you wil not be short on all films based on him there, but what about the classics we don't get to see that much? AMC does a good job regardless but I suppose they need to give people's nerves a break. They have some oldies but goodies like, The Howling, Cujo, and Stephen King's Silver Bullet but what what you watch if you had your own horror movie marathon? If you don't own your own personal classics +Netflix has been pretty good at updating their streaming horror lists with films like Dreamscape, (a personal favorite).